Rob Papen has fast become a leader in virtual synthesizers, and one of their more recent synthesizers is the Blue II “cross-fusion” synthesizer, released earlier this year. The original Blue synthesizer was released in 2005 with much success, but will the second version live up to the firsts name? Once the plugin is installed and first opened, users will notice the modern looking user interface, which is refreshing when comparing to other Rob Papen plugins. While looks aren’t really that important, it is nice when a plugin looks good. Most of the main screen is dedicated to showing controls for the six oscillators. These controls are pretty straightforward, but having that many options is really nice. Below that there are two filters with their controls, with 27 filter types per filter. Then, underneath that, there are controls for the envelopes, LFO, and so on. The synth also includes a full FM matrix. The XY page of the Blue II allows users to assign 16 parameters in the synth to an easily controllable interface, and is a great addition, and very easy to use. All of these features make for an amazingly versatile and complex synth. While the synth may be complex in features, it’s incredibly easy to use and control. The plugin is laid out in a way that is easy to navigate and get around, which is definitely a plus. Because of the huge number of options when it comes to the synth, it is very versatile. The synth comes with a ton of plugins, so if you find all the knobs too intimidating, you can probably find a preset that’s close and adjust it to taste. Many of the presets are pretty obscure, but if you dig through them enough you should be able to find something you like. Of course, an alternative would be to simply learn how to properly use the plugin. The core of the synthesizer is the FM routing matrix, which allows each oscillator to modulate each other oscillator as much as the users wants. Apart from that, users can set each oscillator to ring modulation mode, or to simply sync to the first oscillator. Not only that, but the FM routing matrix also comes with over 30 preset routing situations. The Blue II also includes four effects banks, and each filter or oscillator can be routed to one of these effects banks. There are a number of effects, including reverb, delay, EQ, amp simulations, and so on. The effects sound good, and allow users to really make their sounds stand out. 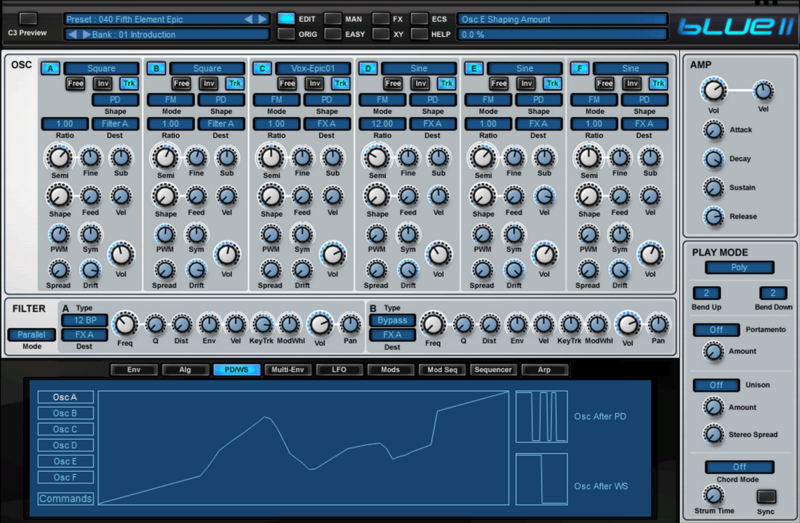 The Rob Papen Blue II synthesizer quite possibly heralds the future of synthesis – crossfusion. The synth is easy to use, very versatile, and sounds great. The plugin boasts a good-looking interface, with a sound to match.